34 A None No Power Seat 34 A is an Economy Class seat that may have limited recline due to the Exit Row behind. 34 B None No Power Seat 34 B is an Economy Class seat that may have limited recline due to the Exit Row behind. 34 C None No Power Seat 34 C is an Economy Class seat that may have limited recline due to the Exit Row behind. 34 J None No Power Seat 34 J is an Economy Class seat that may have limited recline due to the Exit Row behind. 34 K None No Power Seat 34 K is an Economy Class seat that may have limited recline due to the Exit Row behind. 34 L None No Power Seat 34 L is an Economy Class seat that may have limited recline due to the Exit Row behind. 35 A None No Power Seat 35 A is an Economy Class Exit Row seat with extra legroom. The tray table is in the armrest, making the armrest immovable and slightly reducing seat width. There is no floor storage for this seat during take-off or landing. 35 B None No Power Seat 35 B is an Economy Class Exit Row seat with extra legroom. The tray table is in the armrest, making the armrest immovable and slightly reducing seat width. There is no floor storage for this seat during take-off or landing. 35 C None No Power Seat 35 C is an Economy Class Exit Row seat with extra legroom. The tray table is in the armrest, making the armrest immovable and slightly reducing seat width. There is no floor storage for this seat during take-off or landing. 35 J None No Power Seat 35 J is an Economy Class Exit Row seat with extra legroom. The tray table is in the armrest, making the armrest immovable and slightly reducing seat width. There is no floor storage for this seat during take-off or landing. 35 K None No Power Seat 35 K is an Economy Class Exit Row seat with extra legroom. The tray table is in the armrest, making the armrest immovable and slightly reducing seat width. There is no floor storage for this seat during take-off or landing. 35 L None No Power Seat 35 L is an Economy Class Exit Row seat with extra legroom. The tray table is in the armrest, making the armrest immovable and slightly reducing seat width. There is no floor storage for this seat during take-off or landing. 49 C None No Power Seat 49 C is an Economy Class seat in the last row of the plane that may have limited recline. The close proximity to the lavatories and galley may be bothersome. 49 J None No Power Seat 49 J is an Economy Class seat in the last row of the plane that may have limited recline. The close proximity to the lavatories and galley may be bothersome. 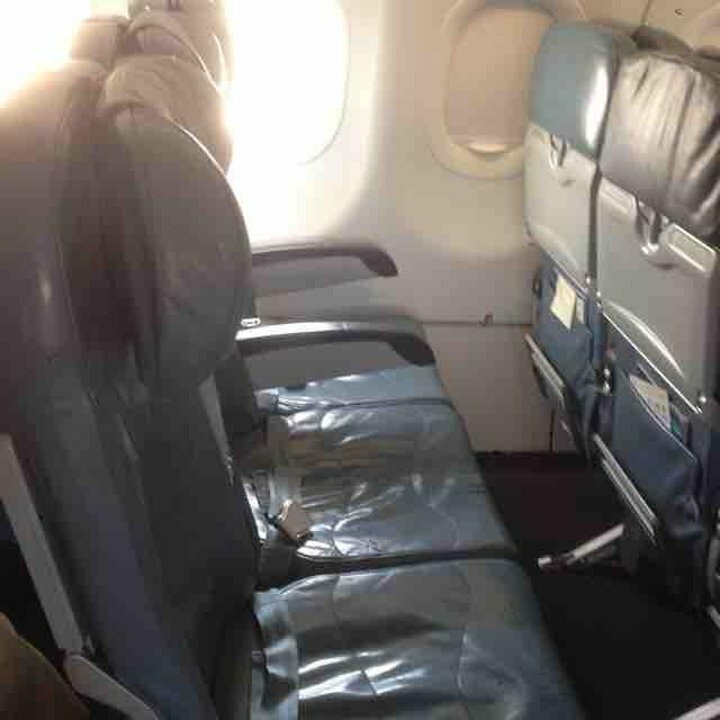 49 K None No Power Seat 49 K is an Economy Class seat in the last row of the plane that may have limited recline. The close proximity to the lavatories and galley may be bothersome. 49 L None No Power Seat 49 L is an Economy Class seat in the last row of the plane that may have limited recline. The close proximity to the lavatories and galley may be bothersome. Saudia Airlines flies two version of the Airbus A320. This version has 132 seats in a two-class configuration of Business and Economy. Guest Class is Saudia's Economy Class product. There are 28 of this aircraft in the Saudia fleet. Excellent flight. I took this flight on its Geneva-Jeddah leg. I had called Saudia and booked seat 49a. However upon boarding I realized that the flight was almost empty. A very nice flight attendant(a rare occurence in a Saudia flight) had asked me if I could sit in a different seat as it would give the crew a better flight. The food was great as it is in all Saudia flights and since flight was almost empty we got lots of extras. Only downside though is that there is no visual entertainment in economy class. It is the same flight they usually use for domestic flying in the kingdom however I felt it was a bit too much to ask from customers to survive with no media entertainment for 5 hours in this day and age. Overall it was a pleasant journey.